With this kit—and a generous budget—your students can create code that will be sent into orbit, collecting data from a satellite. What if your students could craft experiments that collect data in space? With the Ardusat Space Kit, they can learn about the sensors used on space satellites, the types of data those sensors collect, how to write code for data collection, and possibly, have that code used in orbit. 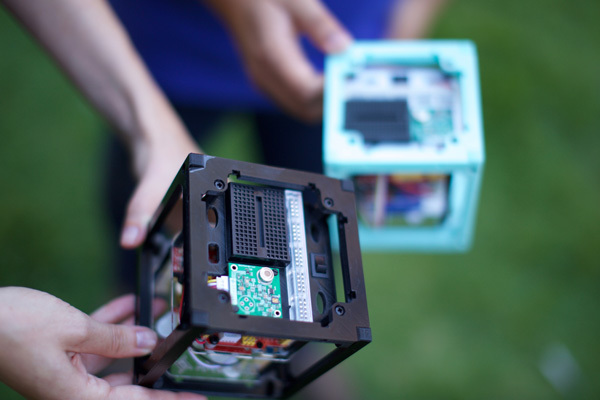 In partnership with Spire, a satellite data collection company, Ardusat makes data-collecting satellites available to students. The Ardusat Space Kit ($150) comes with an Arduino Uno, four sensors (temperature, luminosity, infrared, and ultraviolet), a breadboard (a solderless, plastic board used for experimenting with circuits), resistors, LEDs, and jumper wires. Never used an Arduino? No problem. The helpful video tutorials and step-by-step instructions in the introductory lesson teach users to install the Arduino software, build circuits, edit “sketches” (Arduino programs), and collect data. To send an experiment into space, though, it is necessary to purchase a Classroom Launch Pack. That annual subscription includes 10 Space Kits with professional support, and a site license for the Experiment Platform and eHub. Each kit can accommodate two or three students. Ardusat team members work closely with educators to help them design and test classroom experiments and prepare the one that will be conducted from space. Once an experiment is finalized, Ardusat uploads the code to a satellite. Finally, they download and deliver the data back to the educator and students for analysis. An annual subscription that results in one space launch costs $3,000 for elementary level, $4,500 for middle school, and $5,000 for high school. Subsequent years’ subscriptions cost less, since the hardware is already in place. Students decide what information to gather and why. For example, one school is collecting data from the Pacific Ocean in order to draw correlations between surface temperature and storm intensity. Another is measuring the interaction of ultraviolet rays with water in drought-affected regions of California. These and other real-time experiments can be viewed online. The Ardusat Space Kit and accompanying online lessons can spark creativity in students, and are great for learning how to use an Arduino, breadboards, and sensors. With the $150 kit alone, students can design and run projects here on Earth using the ultraviolet, temperature, luminosity, and infrared sensors. The hitch, of course, is that for your students to collect data from space, you’d need the budget to purchase a Launch Pack. I am based in China and is interested in purchasing your kit for educational purposes. Please advise how to go about making the purchase. If possible, I would be interested in talk to you about contracting your business in China.